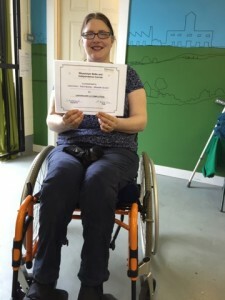 Photos Below: Clare a recent graduate from the Experience Community Wheelchair Skills and Independent Living Course. After completing the course some of Clare’s comments included “It’s been life changing” and “I’ve got my life back”. She is now going on holiday for the first time since becoming disabled and is considering applying for a job. 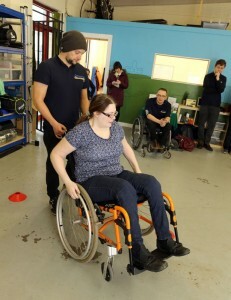 Clare also felt confident enough to join in some of Experience Community’s other activities and has tried a Mountain Trike and now regularly attends our weekend rambles. The course is run from our unit at Slaithwaite and if you are interested in registering for the course then contact us.